Man is a microcosm…an extract from all the stars and planets of the whole firmament, from the earth and the elements; and so he is their quintessence. The body is perpetually building, breaking down, & rebuilding anew only to repeat the cycle all over again. writes…Nietzsche, of course! Indeed all forms of Nature take part in this grand circumambulatory cakewalk. Too much growth suffocates; too little & we wither away to non-being. So we see life as a tango performed betwixt the twin poles of creation & annihilation; an interminable dance of dynamic oscillation. Homeostasis of the living organism represents an equilibrium that is never static. Rather, constant re-calibration characterises this condition. One direction grows into order, the other dissolves into entropy. The physiologists describe the these processes with the terms anabolism & catabolism. The former builds matter, the latter generates energy to animate it; between the two, life flows. Metabolism represents this interplay. This vital equilibrium of the physical organism finds colorful expression in Hindu mythology. Central to this cosmogony is the trimürti, the three aspects of the Hindu godhead, called Brahma, Vishnu, & Shiva. Brahma creates the universe, generating form from emptiness. Immediately following creation, everything is immaculate. This is the Golden Age. Vishnu preserves the creation, presiding over the grand cosmic carnival. But as anyone who frequently partakes in life’s revelry implicitly understands, it is the course of such festivities that they simply cannot persist indefinitely. So the Silver Age follows soft upon its predecessor. Still, though disarray seeps in, order maintains the better hand. With the advent of the Bronze Age, however, the balance begins to tip, unfavorably. In the fourth epoch after creation, called the kali-yuga, the universe deteriorates still further. Horrible traffic, tropical storms, starving children in Somalia—all evidence suggests we’re in the thick of it today. So the kali-yuga approaches its horrible nadir, the culmination of a great decline. As clutter & entropy close in from all quarters, lo! Shiva emerges onto the cosmic stage. 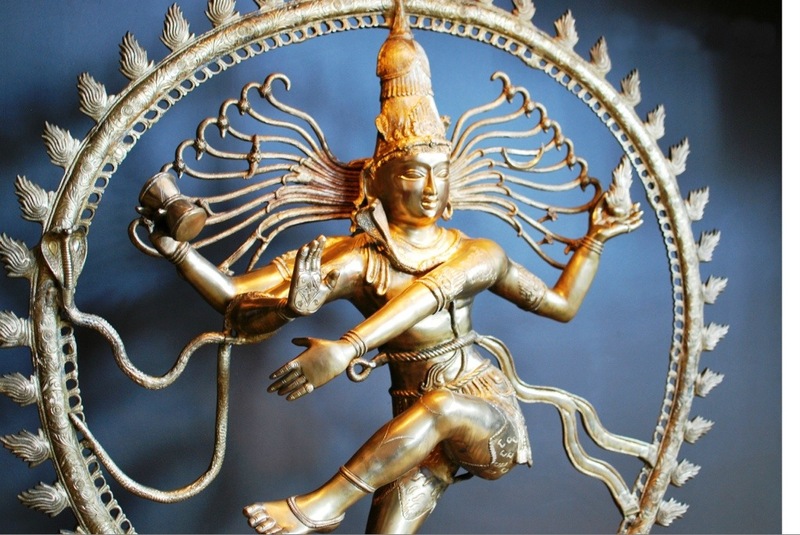 In the avatar of Nataraja, he performs the notorious tandava, the “dance of destruction,” and he annihilates the cosmos in flame. The full catastrophe is realised. His performance finished, Shiva turns to leave. And on the back of his head, behold the mask of Brahma! Thus the cycle begins anew. If a room is full of stuff, it is therefore worthless. So much the more so for the entire cosmos. Today, physicists describe a gradual march towards entropy that is the universe’s inevitable fate. Just as the modern scientific model postulates, as well as the Hindu cosmogony of the four yugas, the human body tends gradually in an analogous direction. (Indeed, this should come as no surprise given that it is the trajectory of the entire cosmos, and we are not separate from it.) In man, the process appears as nervous habits, strains, & chronic muscular tension. Each of us has felt these symptoms of decline. So the multiplying villainies do swarm upon us such that by the time we reach adulthood, most of have accrued such a conditioned surfeit of supererogatory muscular contractions that the mere activity of walking across the parking-lot to get in our cars can start to feel like cleaning the Augean Stables or another of Hercules’ Labors. Indeed the amount of strain we sometimes manage to bear around with us is positively mythic. Contrast this image with that of throwing off a back-pack after a day-hike: pure alleviation. Or the boreal serenity that follows a forest-fire. Destruction clears the space for new growth—like the ecological succession, that finds symbolic expression in the adorable little fernlet that sprouts out of the ashes & scorched earth following the said boreal inferno. Nature embodies this cycle of destruction & renaissance. Whether we look inwards or outwardly for inspiration, we discover this interminable caracole as the course of existence. Our navels are circles & so are the stars. We also notice that the world is never still, & that if we attempt to hold on & fix this helical oscillation at one or the other pole, we burn our hands even as the world slips through our grasp. In my Rolfing® practice, I do my best to serve my client according to his or her individual needs. Sometimes this dictates that I take Brahma’s work as inspiration—attempting to create new kinetic possibilities for the client, & to instruct him in new patterns of movement. On other occasions, I deem it most effective to channel Vishnu: to preserve the easeful revolution of the somatic microcosm. But often Shiva’s enterprise must take precedence: all parasitic & problematic muscular tension must be squelched. Ease is primary, life tends to flow—our charge is to create the conditions to allow for it. So, Shiva-like, we must obliterate all obstructions. Then all that remains is the native grace of the human body.